number, along with the date and location of your sighting. COMMON MERGANGER, TURKEY VULTURE, COOPER'S HAWK, BALD EAGLE, RED-BREASTED SAPSUCKER, DOWNY WOODPECKER, NORTHERN FLICKER, PILEATED WOODPECKER, CEDAR WAXWING, BELTED KINGFISHER, PACIFIC-SLOPE FLYCATCHER, RED-EYED VIREO, CASSIN'S VIREO, WARBLING VIREO, COMMON RAVEN, BAND-TAILED PIGEON, VIOLET-GREEN SWALLOW, BARN SWALLOW,NORTHERN ROUGH-WINGED SWALLOWS, CHESTNUT-BACKED CHICKADEE, RED-BREASTED NUTHATCH, BROWN CREEPER, WINTER WREN, SWAINSON'S THRUSH, AMERICAN ROBIN, ORANGE-CROWNED WARBLER, YELLOW WARBLER, BLACK-THROATED GRAY WARBLER, COMMON YELLOW-THROAT, SPOTTED TOWHEE, SONG SPARROW, CHIPPING SPARROW, FOX SPARROW, BLACK-HEADED GROSBEAK and PURPLE FINCH. A pair of NORTHERN ORIOLES was seen at the marsh in Port Alberni. Ninteen BAND-TAILED PIGEONS were seen visiting feeders along Southwind Drive in upper Lantzville. A female LAZULI BUNTING was seen at the Carmanah Point lighthouse on the west coast of Vancouver Island. A COMMON GRACKLE was spotted in Tofino. WILSON'S WARBLER, CHIPPING SPARROW, BLACK-HEADED GROSBEAK and a large flock of PINE SISKINS were seen in the 100 block of Cathmount Place in Nanaimo. A BULLOCK'S ORIOLE was spotted at Ucluelet on the west coast. A RED-BREASTED SAPSUCKER was seen poking holes in an Eucalyptus Tree in a yard at Deep Bay. We saw a large, very long winged mainly white bird fly right overhead in the direction of the Georgia Strait. The wings were very long, slender and pointed at the tips. The head was all white with a yellow bill and some black at the base of the bill. The head and neck stuck well out in front and the tail projected well out the back so that the wings appeared to be positioned about halfway along the body. It was clearly not a gull or tern and seemed at least as big as a Glaucous-winged Gull, likely bigger. The under sides of the wings were mainly white with some duskiness along the trailing edge and out towards the tips. The flight was strong and direct. It was also not very high, perhaps twice treetop height. Eight or ten flaps and it was out of sight. .
MALLARD, CALIFORNIA QUAIL, MASKED BOOBY, TURKEY VULTURE, BALD EAGLE, COOPER'S HAWK, KILLDEER, SEMI-PALMATED SANDPIPER, GLAUCOUS-WINGED GULL, RUFOUS HUMMINGBIRD, HAIRY WOODPECKER, NORTHERN FLICKER, PILEATED WOODPECKER, PACIFIC-SLOPE FLYCATCHER, CASSIN'S VIREO, WARBLING VIREO, NORTHWESTERN CROW, COMMON RAVEN, VIOLET-GREEN SWALLOW, NORTHERN ROUGH-WINGED SWALLOW, CHESTNUT-BACKED CHICKADEE, BEWICK'S WREN, WINTER WREN, AMERICAN DIPPER, HERMIT THRUSH, SWAINSON'S THRUSH, AMERICAN ROBIN, EUROPEAN STARLING, ORANGE-CROWNED WARBLER, YELLOW WARBLER, TOWNSEND'S WARBLER, YELLOW-RUMPED WARBLER, WILSON'S WARBLER, SPOTTED TOWHEE, CHIPPING SPARROW, SONG SPARROW, WHITE-CROWNED SPARROW, DARK-EYED JUNCO, BLACK-HEADED GROSBEAK, BROWN-HEADED COWBIRD, PURPLE FINCH, PINE SISKIN, AMERICAN GOLDFINCH. VESPER SPARROWS were seen singing from the southern most perimeter fence which can be viewed from the dirt road south of the Nanaimo Airport in Cassidy. A NORTHERN MOCKINGBIRD was seen near the Nanaimo Airport in Cassidy at the southern perimeter fenceline. A pair of AMERICAN GOLDFINCH are visiting feeders along Kilpatrick Road in the Junglepot area of Nanaimo. Sixteen RED-THROATED LOONS were seen landing at Parksville Bay in Parksville. WILSON'S and YELLOW WARBLERS were seen in a back yard along Heather Place in Parksville. A SOLITARY SANDPIPER was seen on the north shore of Long Lake in Nanaimo. A WESTERN TANAGER was seen along West Crescent in Qualicum Beach. Twelve BAND-TAILED PIGEONS were visiting ground feeder and a NORTHERN FLICKER is visiting the suet feeder in the 100 block of Meridian Way in Parksville. Monday, May 28, 2007@ 7:30 pm. 9:00 a.m. in Parksville or under the Hydro lines on Normarel Drive at about 9:30am. To get to Legacy Marsh from Parksville follow Highway 19 and turn right onto Superior Road follow Superior Road to Normarel Drive turn left and go down to the Hydro Lines and park. The Sunday Bird Walk on June 03, 2007 will be going to Springwood Park (the woods at the end of Despard Avenue, across from Chestnut Street). We will meet at the Bird Store at 9:00 a.m.or at the parking area near Despard Avenue (turn left off Highway 4A going into Parksville) and Chestnut Street at about 9:30 a.m.
Coming from Nanaimo take the # 51 exit off the Inland Island Highway and head into Parksville along highway 4A. Turn left at the first set of lights(Despard Avenue) and go to the end of Despard Avenue, just past Chestnut Street. A possible LEWIS WOODPECKER was seen along Northwest Bay Road near the Logging Road in Nanoose Bay. SONG SPARROW, DARK-EYED JUNCO, RED-WINGED BLACKBIRD, PURPLE FINCH and PINE SISKIN. PINE GROSBEAKS were seen along Heath Avenue in Parksville. A pair of CALIFORNIA QUAIL are visiting a yard in the Lynburn area of Nanaimo. A ROUGH-LEGGED HAWK was seen along Northwest Bay Road near Wall Beach Road in Nanoose Bay. A MOURNING DOVE was spotted in the 100 block of Meridian Way in Parksville. A LARK SPARROW was seen in the 2600 block of Lungren Road in the Divers Lake area of Nanaimo. A YELLOW-RUMPED WARBLER was seen along Andover Road in Nanoose Bay. 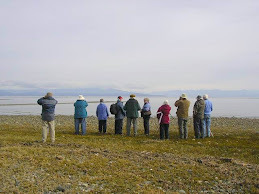 The Wednesday Bird Walk went to the Englishman River Estuary, Plummer Road side. The highlights included watching NORTHERN ROUGH-WINGED SWALLOWS going into their nest along the River Bank. We saw a PACIFIC LOON and a PIGEON GUILLEMOT in breeding plumage off shore. In the mud flats we saw three DUNLIN and six WESTERN SANDPIPERS, in breeding plumage, feed in the mud flats. Three SPOTTED SANDPIPERS in breeding plumage moved along the River giving us great sightings. Eleven birders found the following fifty species. CANADA GOOSE, BRANT, MALLARD, HARLEQUIN DUCK, SURF SCOTER, COMMON MERGANSER, CALIFORNIA QUAIL, PACIFIC LOON, GREAT BLUE HERON, TURKEY VULTURE, OSPREY, BALD EAGLE, SHARP-SHINNED HAWK, KILLDEER, SPOTTED SANDPIPER, WESTERN SANDPIPER, DUNLIN, MEW GULL, GLAUCOUS-WINGED GULL, PIGEON GUILLEMOT, RUFOUS HUMMINGBIRD, NORTHERN FLICKER, NORTHWESTERN CROW, COMMON RAVEN, VIOLET-GREEN SWALLOW, NORTHERN ROUGH-WINGED SWALLOW, BARN SWALLOW, CHESTNUT-BACKED CHICKADEE, RED-BREASTED NUTHATCH, BEWICK'S WREN, SWAINSON'S THRUSH, AMERICAN ROBIN, EUROPEAN STARLING, CEDAR WAXWINGS, ORANGE-CROWNED WARBLER, YELLOW WARBLER, BLACK-THROATED GRAY WARBLER, MACGILLIVRAY'S WARBLER, WILSON'S WARBLER, SPOTTED TOWHEE, SAVANNAH SPARROW, SONG SPARROW, WHITE-CROWNED SPARROW, RED-WINGED BLACKBIRD, BREWER'S BLACKBIRD, BROWN-HEADED COWBIRD, PURPLE FINCH, HOUSE FINCH, AMERICAN GOLDFINCH and HOUSE SPARROW. A BROWN PELICAN was spotted at the French Creek marina area in French Creek. Two MOURNING DOVES were seen along Maxey Road in south Nanaimo. A BLACK-HEADED GROSEBEAK was seen along Birchwood Road in Ladysmith. A BULLOCK'S ORIOLE, YELLOW WARBLERS and MARSH WRENS were seen at Buttertubs Marsh in Nanaimo. WESTERN TANAGERS, RUFOUS and ANNA'S HUMMINGBIRDS were seen in the 4100 block of Gulfview Drive in Nanaimo. The Sunday Bird Walk on May 27, 2007 will be going to the Morden Collery Provincial Park off Highway One and Morden Road in south Nanaimo, weather permitting--winds, torrential rains will deter us! Meet at the Bird Store at 9:00 a.m. or at the parking area at Morden Collery Provincial Park at about 9:30 a.m. This morning we received a report of a LARK SPARROW visiting a backyard feeder in the Divers Lake area of Nanaimo. There have been very few records of a Lark Sparrow in Nanaimo. For more information about its location please call the store, 390-3669. Bug Lady Seminar a Success! The Bug Lady seminar was a wonderful success. For about 17 guests, Jessica Dawe, from The Bug Lady gave an enthusiastic talk about pest management in the garden. She talked about creating a garden that is balanced so that "the right bugs" are already there. From time time to time, she pointed out, things get out of balance and that's when we visit retailers like The Backyard Wildbird & Nature Store to pick up a bag of ladybugs (native species) to treat an aphid problem or a package of Weevilution for the weevils affecting your Rhododendron's. She was full of wonderful insights and recommendations. On the Bug Lady website there are some fantastic resources as well. Companion planting, integrated pest management and bug identification. Today we have received three reports of hundreds to thousands of Swifts in Ladysmith, Port Alberni and Royston. In two of these reports the Swifts were seen flying down chimneys by and some getting right in to the houses. There are two species of Swifts that are commonly seen on the island, Black and Vaux's Swift. One of the reports mentioned it as watching something out of the Alfred Hitchcock movie "The Birds". The Sunday Bird Walk went to Beck Creek and Chase River Estuary in Nanaimo. The highlight of the walk was over twenty noisey WHIMBREL flying over us. Six GREATER YELLOWLEGS were feeding on the mud flats. GREAT BLUE HERON, CANADA GOOSE, MALLARD, BUFFLEHEAD, COMMON MERGANSER, RING-NECKED PHEASANT, CALIFORNIA QUAIL, WHIMBREL, GREATER YELLOWLEGS, GLAUCOUS-WINGED GULL, BAND-TAILED PIGEON, ROCK PIGEON, RUFOUS HUMMINGBIRD, BELTED KINGFISHER, NORTHERN FLICKER, PILEATED WOODPECKER, NORTHWESTERN CROW, COMMON RAVEN, PURPLE MARTIN, TREE SWALLOW, VIOLET-GREEN SWALLOW, CHESTNUT-BACKED CHICKADEE, BROWN CREEPER, BEWICK'S WREN, GOLDEN-CROWNED KINGLET, HERMIT THRUSH, VARIED THRUSH, AMERICAN ROBIN, EUROPEAN STARLING, ORANGE-CROWNED WARBLER, YELLOW WARBLER, COMMON YELLOW-THROAT, YELLOW-RUMPED WARBLER, SPOTTED TOWHEE, SONG SPARROW, RED-WINGED BLACKBIRD, BROWN-HEADED COWBIRD, PURPLE FINCH, HOUSE FINCH, AMERICAN GOLDFINCH, PINE SISKINS, DARK-EYED JUNCOS, HOUSE SPARROW and WINTER WREN. A YELLOW-HEADED BLACKBIRD was seen at the end of Tweedshope Road in Lower Lantzville. Four AMERICAN GOLDFINCH were seen at feeders at Lantzville Road and Superior Roads in Lantzville. A SILVER PHEASANT was at feeders in the 5100 block of Lauguna Way in Nanaimo. A YELLOW-HEADED BLACKBIRD in with a flock of BREWERS BLACKBIRDS were seen perched on a fence on the south side of Northwest Bay Road just to the east of Wallbeach Road in Nanoose Bay. A LESSER CANADA GOOSE was seen in with five CANADA GEESE at Cowichan Bay. Two ROUGH-WINGED SWALLOWS, four CHIPPING SPARROWS, three YELLOW WARBLERS and a PURPLE MARTIN were seen at Somenos Marsh in Duncan. The Wednesday bird walk went to the Beaver Ponds at Nanoose Bay. Among the highlights was the song of a "CHESTNUT-SIDED WARBLER" singing near the first pond and several sightings of BLACK-THROATED GRAY and TOWNSEND'S WARBLERS. The bird of the day, a WESTERN TANAGER was seen near the big pond. He was perched high in an Arbutus Tree giving all of us a great sighting. A BULLOCK'S ORIOLE was seen at his usual summer location, near the old foundation at Buttertubs Marsh in Nanaimo. A BLACK-HEADED GROSBEAK was seen visiting feeders at Qualicum Village north and west of Qualicum Beach. A WESTERN TANAGER was seen on Gabrolia Island. A NORTHERN FLICKER was seen along Seablush Road in Nanoose Bay. An AMERICAN DIPPER was seen at Colliery Dam Park in Nanaimo. GOLDEN-CROWNED SPARROWS and AMERICAN GOLDFINCH were seen in the 4300 block of Shell Beach Road in Ladysmith. EVENING GROSBEAKS and AMERICAN GOLDFINCH were spotted in the 500 block of Spirting Road in Nanaimo. Six EVENING GROSBEAKS were seen in the 800 block of Middlescot Road in Errington. Three LESSER YELLOWLEGS, CASSIN'S VIREO, CHIPPING SPARROWS, YELLOW-RUMPED, ORANGE-CROWNED, TOWNSEND'S and WILSON'S WARBLERS were seen on the Top Bridge Trail in Parksville. AMERICAN GOLDFINCH were spotted in the 400 block of Millstone Avenue in Nanaimo. Speakers: Brian Kingzett, "Coastal Shellfish"
Marianne Wade, "Update: Fairwinds Critical Areas"
The Wednesday Bird Walk on May 9, 2007 will be going to Springwood Park (the woods at the end of Despard Avenue, across from Chestnut Street). We will meet at the east parking lot of The Parksville Civic and Technology Centre at Jensen Avenue and McCarter Street at 9:00 a.m. in Parksville or at the parking area near Despard Avenue (turn left off Highway 4A going into Parksville) and Chestnut Street. The Sunday Bird Walk on May 13, 2007 will be going to Buttertubs Marsh in Nanaimo, weather permitting--winds, torrential rains will deter us! Meet at the Bird Store at 9:00 a.m. or at the parking area on Bowen Road side of Buttertubs Marsh at about 9: 20 am. FOR THIS VERY INTERESTING FREE WORKSHOP! DEAL WITH GARDEN PESTS NATURALLY! The Birdman is pleased to host a morning with The Bug Lady! The Bug Lady will be in the store to answer your questions about beneficial bugs. · When and how to apply beneficial bugs? · How to deal with cranefly, aphids, mealybugs, fungus gnat, spidermite, slugs, composting and more!